Carnegie Mellon University Press, 9780887486067, 64pp. 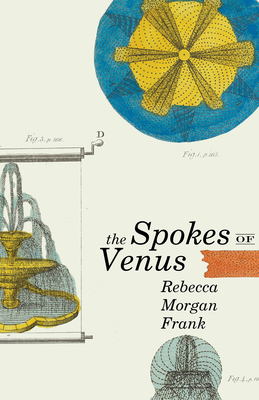 Magicians, wig makers, sculptors, perfumers, choreographers, and composers all help conjure the worlds of Frank’s second collection, The Spokes of Venus. These poems offer a landscape shaped by the tensions between the act of making and the art of observing. If music and art are the sisters of poetry, this collection is a chorus—a glorious one—of siblings arguing and singing. REBECCA MORGAN FRANK’S first book, Little Murders Everywhere, was a finalist for the 2013 Kate Tufts Discovery Award, and she is the recipient of the Poetry Society of America’s Alice Fay di Castagnola Award. Her poems have appeared in New England Review, Ploughshares, Guernica, Harvard Review, and elsewhere. Frank is an assistant professor at the University of Southern Mississippi’s Center for Writers.